Debt snowball, avalanche or consolidation, which is the secret ingredient to finally paying off your debt? Being debt free is the foundation of financial freedom. Once you’re free of debt you can begin to actively invest and build the assets that will enable you to retire, whether you’re aiming for early retirement or not. So, what’s the best way to tackle your debt? Here are the three key methods for reducing your debt. According to Investopedia, the debt avalanche method involves paying off your debt with the highest interest first and paying only the minimum repayment on all other debts until the first debt is cleared. Once that first debt is paid in full you then apply that payment amount to the next highest interest debt, and then the next until they’re all paid off. Using the debt avalanche method ensures you pay the least amount of interest on your debt. If you’d like to run the numbers for yourself, check out the debt avalanche calculator on Jean Chatzky’s site. The debt snowball method is most often attributed to Dave Ramsey. Dave is very enthusiastic in his support of this debt repayment method. The debt snowball approach results in quick wins as you aim to pay off your smallest debt first. Once your smallest debt is gone, you start on the next smallest debt and work your way up to your highest debt, regardless of the interest rate each debt attracts. The reason for tackling your smallest debt first is more behavioural than mathematical: you see results more quickly and that motivates you to continue. If you’re curious about setting up a debt snowball plan, you can use this calculator. “The combining of several unsecured debts into a single, new loan that is more favorable”, Investopedia. This method is most often used when you’re struggling with high interest consumer debt. If you’re disciplined, it can help you get your finances under control. If you’re not, it’s a recipe for disaster. This method will give you some short term relief but it will not help you if you’re still acquiring debt. 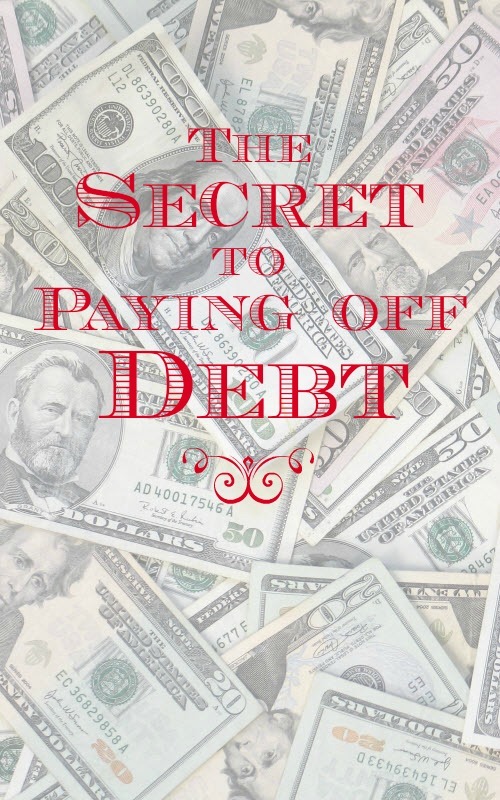 What is the Secret to Paying Off Debt? The secret is there’s no right or wrong way to pay off your debt, you just need to be consistent. Not surprisingly, the best debt repayment method or plan is the one that works best for you. If you can muster up the discipline for the long haul, the avalanche method will be the one that saves you the most in interest payments over the repayment period. If you think you’ll need to feel the rush of paying off a debt quickly, then you’ll benefit most from the debt snowball method. Research by the Kellogg School of Management has shown the debt snowball approach to be the most successful because , according to David Gal, “We found that closing debt accounts — Independent of the dollar balances of the closed accounts—predicted successful debt elimination at any point in the debt settlement program”. It seems it’s not just your debt repayments that snowball but your motivation, too. What’s your preferred method of paying down debt? Why? I’ve enjoyed using the snowball method, with some tweaks. I first paid off each of my high-interest credit cards from smallest to largest and then moved on to my student loans and then will do my mortgage. It’s been amazing to see debts being eliminated one at a time, and with as high an interest rate as my cards were (most at 25% and one at zero for a year) and as low as my student loans (most at 4%- a couple at 8%) and mortgage (3%) are, this plan has made sense. It’s definitely motivating to see those debts come off the financial ‘to do’ list. I’m using the Debt Snowball method. I’m making some decent progress too. I’ve paid off one debt and another should be paid off before the summer is over. Congrats! Being able to put a big fat line through that debt must have been empowering! An interesting article. And i agree about making your debt manageable. But it’s a fallacy to think that you must pay off all your debt. And that you can/should live debt free. The truth is everyone can have debt that’s “within your income”. Anything that goes beyond that needs to be paid off. And i’m referring to credit cards and student loans here. Mortgage debt is nice to pay off sooner. But in reality, isn’t the end all or be all. It gives us a nice warm feeling to be completely debt free. But the real world today doesn’t work like this. We need a few credit cards for emergencies and to maintain a good credit rating. You know that if you need a repair or something immediately. Your chances of getting a bank loan or a loan from a relative or friend are practically non existent. So credit cards are a necessary evil in the 21th century. And the majority of financial experts tell us not to close down CC accounts as that will negatively impact our rating. So bottom line, a person needs to be a real adult and never to let debt exceed their income. If you can do this. You’ll be fine. Debt can be useful, yes, but that doesn’t mean you should carry it around forever. Debt costs you. I’d much rather be debt free. In My opinion, if you ARE debt free keep a few credit cards open. If you use them, only spend what you can pay back THAT MONTH. Your credit will go up – AND your DTR (debt to income ratio) will be at a good level with a ton (hopefully) of available credit, and little to no debt owed to those creditors. Anyways, my $0.02 – enjoyed the article!